I have no idea why I have been putting off baking these yellow bundles of joy bursting with fresh strawberries?! 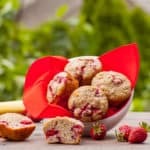 Made with only whole wheat flour, protein powder and no added sugar, you get a strawberry flavour with every muffin’s bite. I know why. 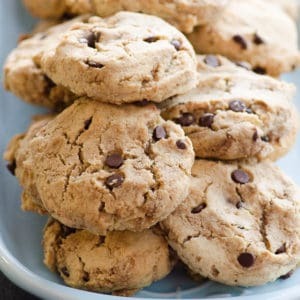 If you are a baker you know how hard it is to get goods made with only whole wheat flour to rise. And secondly, whey protein could make muffins dry and rubbery. OK, you know how Lululemon bags say “Face one fear a day”?! Last Monday I faced some Whole Wheat Strawberry Banana Protein Muffins and baked them 3 times until I (mother-in-law) was happy. 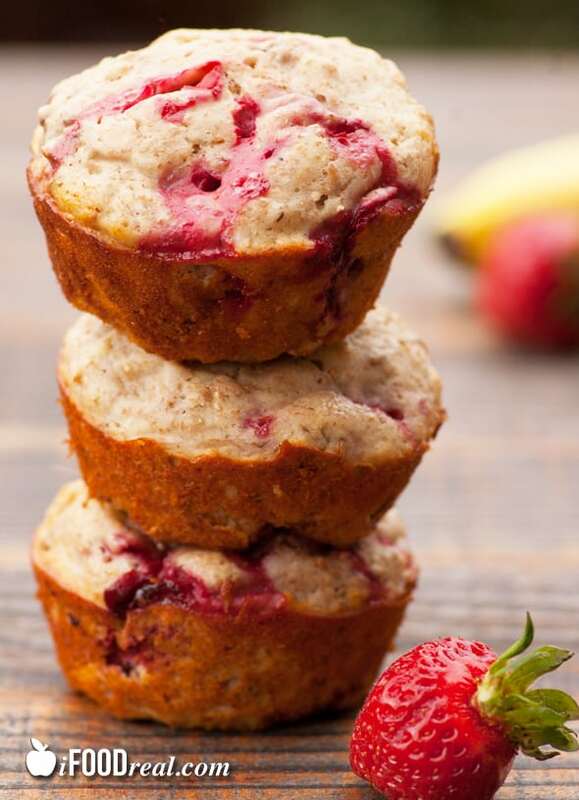 Moist, fluffy, bursting with strawberry flavour muffins! 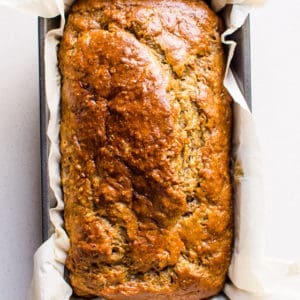 You want to taste the strawberries with every bite and not just “It’s a good healthy banana protein muffin, honey”. And these deliver just that! 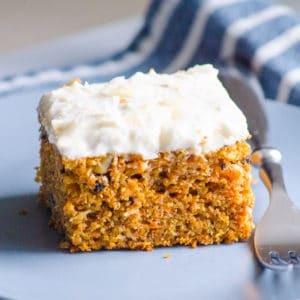 And as for the fear of baking with whey protein powder, the trick is to incorporate a moisturizer like Greek yogurt or cottage cheese into the batter and not to over bake. 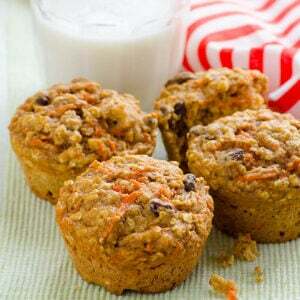 Just insert a toothpick in the middle of a muffin at 18 minutes of baking time as ovens vary. It it comes out clean, it’s ready. You know the drill. 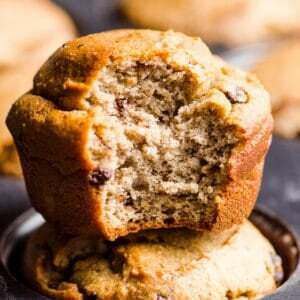 Very important: do not use muffin liners with this recipe as the batter contains no fat. They will stick to the muffins and you will have to eat them because you will have no choice! 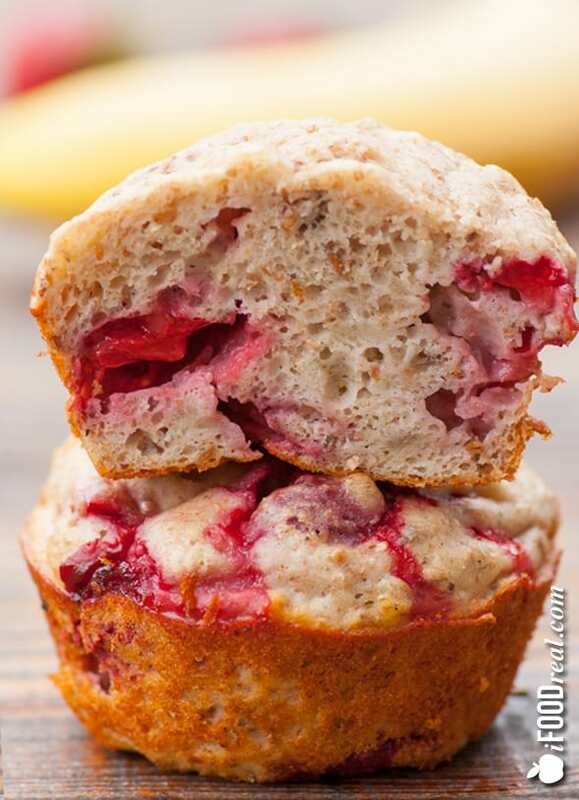 I promise you will want to eat this moist healthy muffin even with a red#40 dye on a $1 paper muffin liner hugging it snuggly. 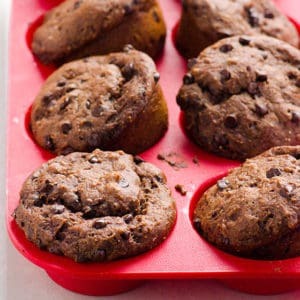 Instead, spray the sides and the bottom of each muffin “hole” with cooking spray and dust with flour. The strawberry season is in a full bloom in Vancouver. 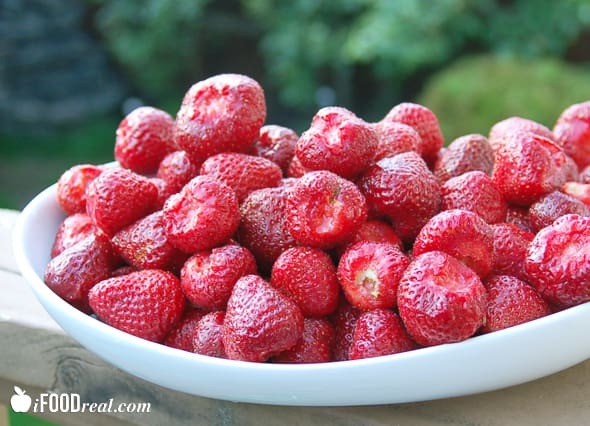 We have been enjoying these local red gems full of vitamin C, fiber and potassium raw, baked into a healthy cobbler, and chopped into blueberry strawberry salsa. So versatile! 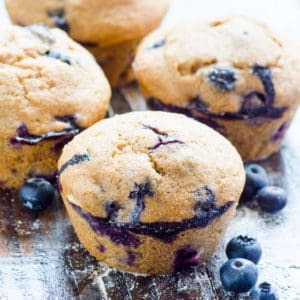 You can use any other berries that are available in your part of the world to make these protein muffins. 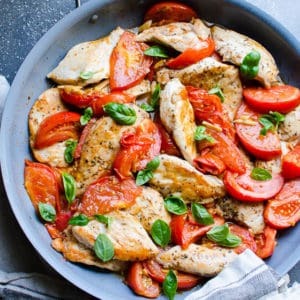 Raspberries, blackberries or blueberries will work great. Heck, mango would taste good in these too. Oh, bananas. The best fruit ever! Delicious, affordable and already pre-packaged. Tell me, isn’t it the best fruit ever?! Bananas are full of potassium, fiber and iron providing energy, improving digestion and brain functioning. 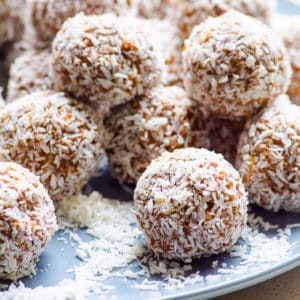 Check out my 10 healthy banana snacks. A tip of the day: don’t bother buying organic bananas since their skin is so thick. 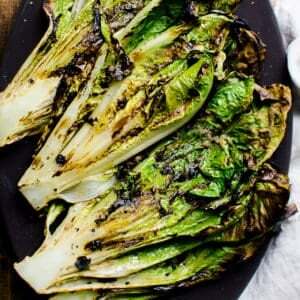 Rather spend saved money on organic leafy greens that are directly exposed to pesticides. 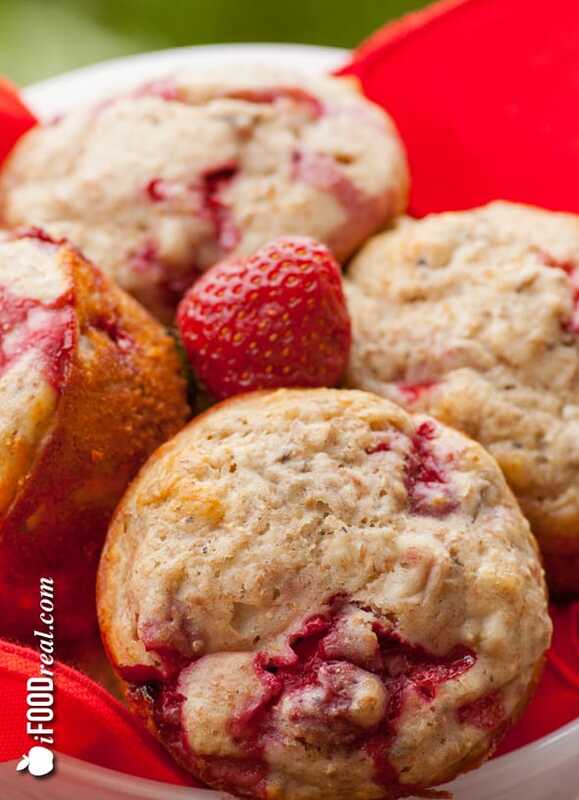 Whole Wheat Banana Strawberry Protein Muffins Recipe – no added sugar, moist and not rubbery at all. 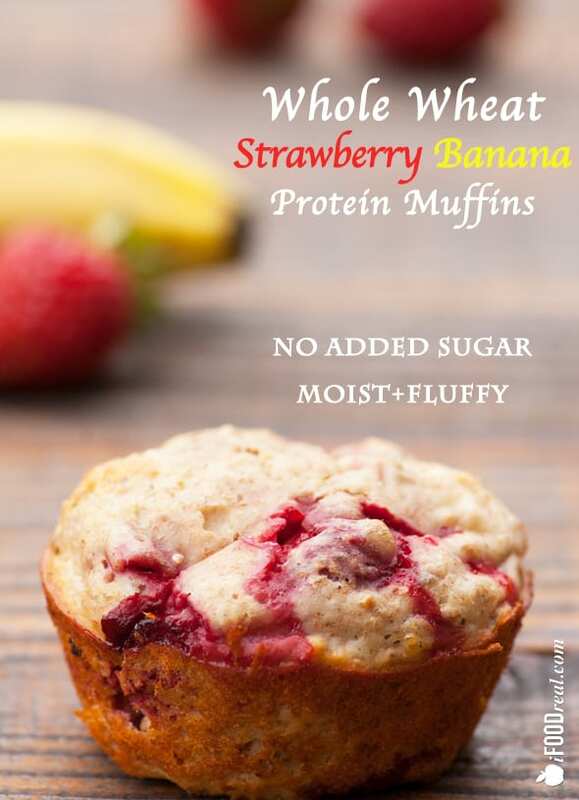 Made only with whole wheat flour, whey protein powder and fresh strawberries. Preheat oven to 350 F, spray regular size 12 muffin baking pan with cooking spray and dust with flour. Set aside. Make sure to cover the sides and bottom of each muffin “hole” completely. Do not use muffin liners. In a medium bowl mash 2 bananas with a fork until smooth. Add egg, Greek yogurt, almond milk and pure vanilla extract. 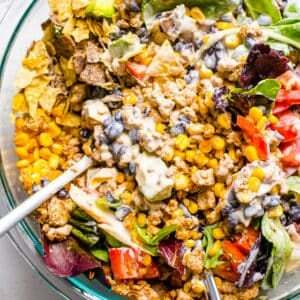 Mix with a fork until smooth and all wet ingredients are combined. 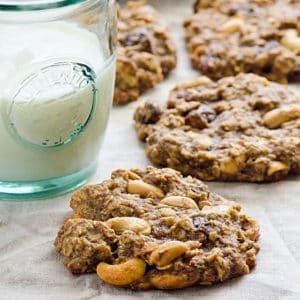 In another medium bowl add all dry ingredients: whole wheat flour, protein powder, flax seeds, baking powder and salt. 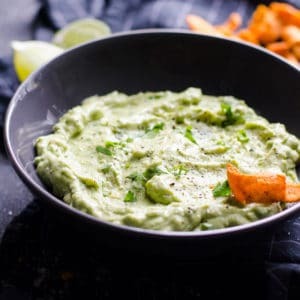 Mix with a spoon or spatula to combine all ingredients. No need to sift the flour. 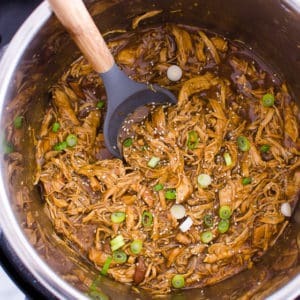 Add dry ingredients to the bowl with wet ingredients and mix just enough to combine. Do not overmix! You don’t want the gluten starting to form and make the muffins rubbery. Add strawberries and give a couple of stirs just enough to incorporate the berries into the dough. 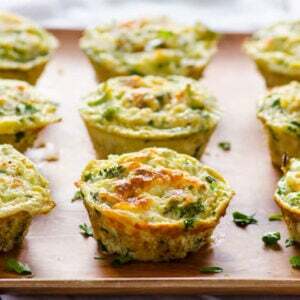 Using 1/4 cup measuring spoon distribute the batter evenly among the 12 muffin forms. Bake for 20 minutes or until the toothpick inserted in the middle comes out clean. I recommend checking the muffins for readiness at minute 18 of baking time as ovens vary. Cool completely before serving. Store: Store in an air tight container in the fridge for up to 3 days or in a freezer for up to a month. To defrost, just thaw on a counter for at least 20 minutes.